Happy Tuesday Friends! I only have 3 days until Spring Break freedom! If you just want the craft and not the social skills idea, skip to the bottom. Although I teach SPED, I know even in a regular class there is always the kid who plays alone. This would be helpful for "that kid" even if he's neurotypical (fancy word for normal, not SPED). Social Skills: A big challenge in my class! Get a bunch of kids with autism/other disabilities on a playground together and NONE of them play together! They wander in circles talking to themselves or grown ups. This week my class is the only one on the playground while the other classes are away at Gold Rush camp. That means it's time for social skills interference at recess! The Solution: A BALL! Super simple, but totally effective! Today the speech teacher gave me a beach ball and one kid was "assigned" the task of asking another student "will you play ball with me?" My goal as the teacher was to facilitate this process. I had the ball in my hand until the student was done with his snack. Joining a group or Initiating Play: This student struggles with verbal skills so I modeled how to ask me for the ball, "Lisa, can I please have the ball?" Then I modeled how he could ask the other student to play with him, " _____ would you like to play ball with me?" Of course things don't always go as planned... The kid said "No" so I actually had to go prompt him too. I went and chatted with him about how the kid who asked him to play never asks to play anything and it's a big deal for him so he should say yes. Thankfully he went back and told the boy, "Sure, I'll play with you." Turn Taking: Once again, an important social skill that can be totally lacking! My guys tend to get distracted right in the middle of the game or just walk away without ever saying anything. As the two boys took turns passing the ball back and forth, I prompted proper play etiquette. I reminded them not to toss it so hard the other kid would have to run for it every time. Then I also prompted one kid not to "stim" (rocking and humming) in the middle of the game because it's "unexpected" (Social Thinking) and the other person may think you don't want to play anymore. Ending Play: You mean running away with the ball isn't an appropriate way to end a game?! I made the kids come back and end the game appropriately like, "thanks for playing! I'm going on the playground now." One boy liked the idea of counting "points" which seemed to be the same as number of turns, and then the game was "done" when he hit whatever number it was. This forced him to play a little longer than he might have naturally (which would have been about 3 seconds!). If you want some social skills picture books I'm OBSESSED with the ones on the right side of my blog by Julia Cook. They are sooo great. I've bought at least 7 or 8 of them! I love crafts! The kids can all participate, no matter their academic level, and it's great for fine motor and sensory integration. This one is SUPER EASY!!!! 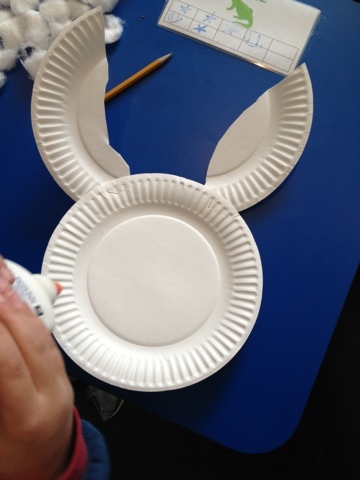 1) Cut 2 ovals out of one paper plate and staple them to the top of a full plate to make a bunny shape. 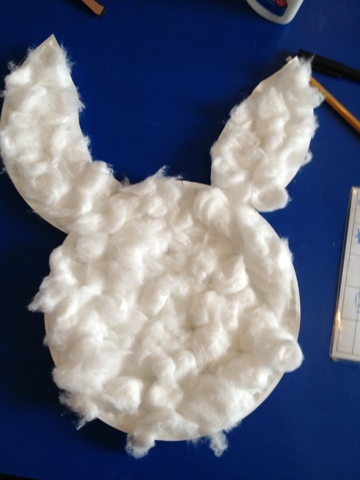 3) Cover the bunny with glue. 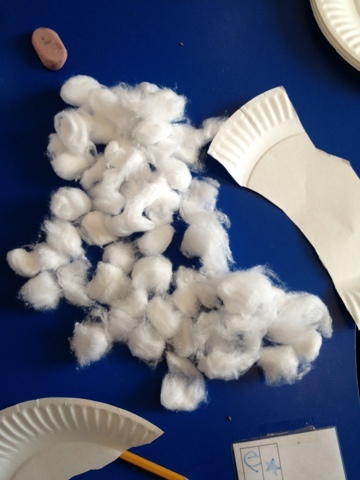 Stick the cotton balls all over! 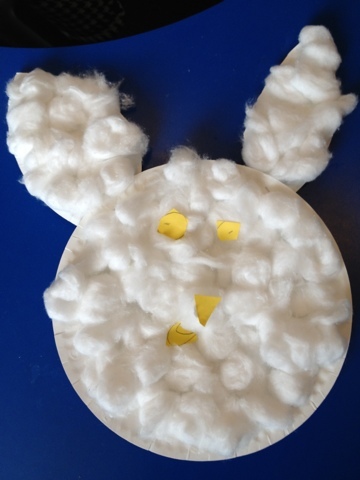 4) Cut out construction paper shapes to make a face. I did not help my students at all with this process. I let them be creative. I doodled a bunny face on the board, but they had free reign for colors, shapes, and sizes of their construction paper. I found it funny that all 3 kids chose one color for the whole face. And you're done! 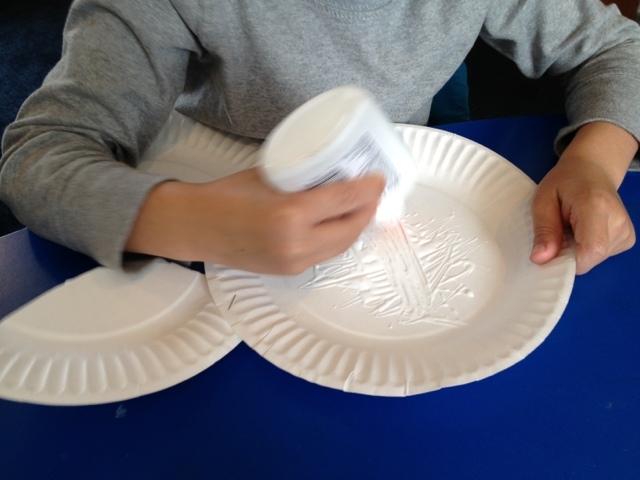 The whole thing took around minutes and the kids could do it pretty independently. What games do you like to play to get kids engaged with each other? 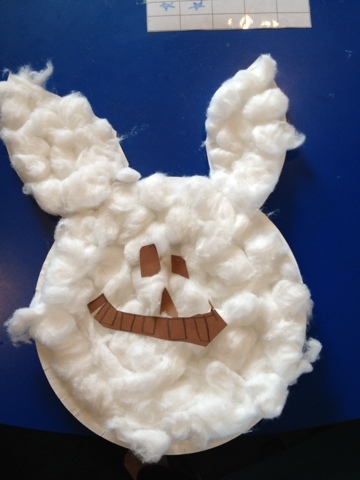 What is your favorite Easter craft?